Happy Hamby Campers: Curtain call! Our van came with curtains. Not great curtains but they were purple, which improved them no end! (I like purple)! Someone had taken a pair of tab-top curtains, cut them into shorter lengths and then roughly hemmed to create window coverings. How do I know they were originally tab-tops? Easy. The tops had been left on as a kind-of funky frill for the set that ran above Erin's bed! 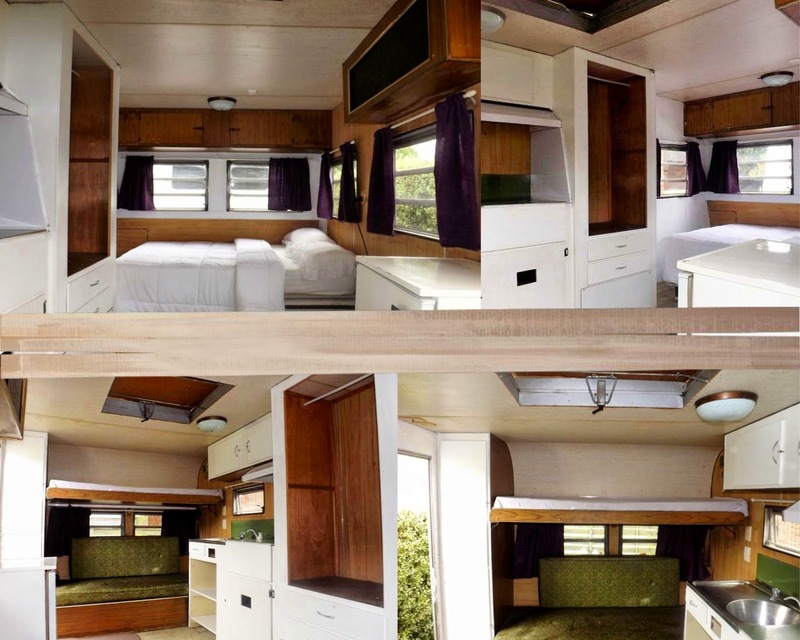 The pics in the top collage were those used in the Gumtree ad for our van. The purple fabric was thin and not very effective for blocking light. As much as I wanted to keep costs down by using up my fabric stash, I didn't have enough thermal-backed curtaining - so I bought two large curtains from the op-shop (for $6.25 each). You can see my first curtain efforts here. I avoided extra cutting and hemming by using the full width of one bought curtain for each of the long rear windows. Both were lined with some light thermal-backed fabric from the stash but it was a scrimped effort and I wasn't entirely happy with the result. The side windows were made from a heavier quality curtain, so didn't require lining. (You can't see in the photos but not all the rods had ends. We bought four packets from Bunnings and they cost nearly as much as the op-shop curtains)! I've used a small piece of leftover (rear window) fabric for the tiny window above the sink. It has a lace curtain as well, which was quite possibly salvaged from the bubble van I renovated as a young mother (with fabric leftover from house curtains made when I was about 21)! The lace is strung along a piece of elastic tied to the rod holders - an idea I borrowed from here (scroll down for pics). Erin bought a lot of the bright striped fabric for her caravan but didn't end up using it. 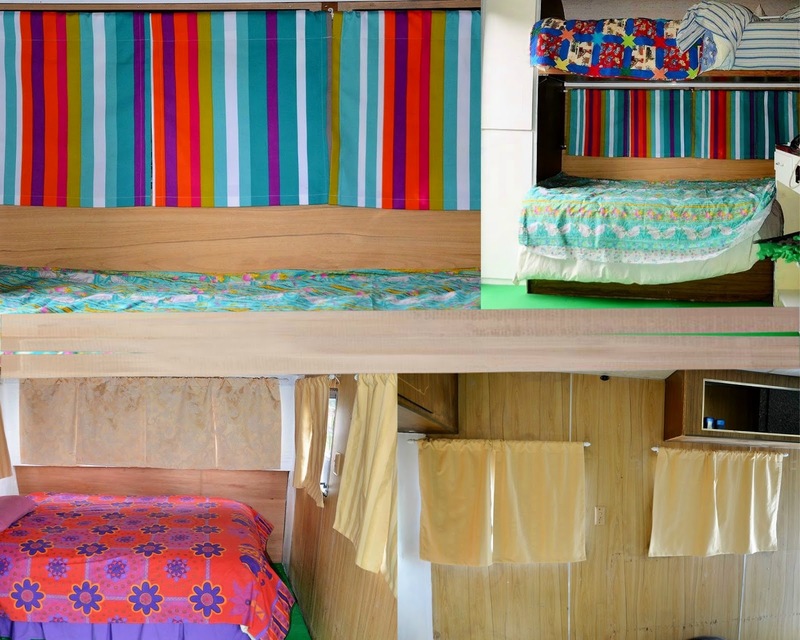 She donated the 8-metre roll to be used in this van, so it seems fitting that the curtains above her bed are made from it. In making those, I discovered a better quality length of thermal lining in the stash. I created a set of four curtains and they should pull across easily to allow light in or viewing out. (The hems don't look level but I'm sure that is due to the curtain hanger, not the curtain hemmer)! Based on the success of Erin's striped curtains, I re-did the set above our bed. I cut the two longer lengths in two, trimmed a bit and then re-hemmed the sides. As part of that process I removed the thinner lining and replaced with the same fabric I used for the front (striped) curtain set. I'm much happier with the end result (which you can see in the bottom left of the second collage pic). At this stage only one window remains - the one in our "new" door. I'm working on a solution for that. There's plenty of material. I just need to decide what sort of covering will be most effective for ease of use. In the past I've made roman blinds and it may be that one of those would be better in this situation - though I might yet have a better idea!